Are you a busy bride who has decided to buy a discount wedding dress online? How are you going to determine whether you are using a reputable online bridal store website? There are so many to choose from. 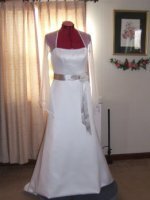 You can ask friends or relatives who have recently married for the site they used to order their gown online. But I feel even with a referral... you need to do some checking into things yourself because there are some precautions you need to take when ordering from shops online. "Judging from reviews I've read on review boards and wedding forums online, some brides skipped this process, resulting in bad consequences." Post a question about the website you are considering to other brides on forums or message boards to get some feedback.You will be able to eliminate a lot of websites off your list just by doing this. Check as many reviews as possible to find out about a website's reputation. This is the first step you should take. Do a search of the "website name" plus the word "reviews." You will pull up review sites and some wedding forums where brides have left reviews about their experience. Check with your country's consumer reporting agency to see the online bridal shop's reputation there. Here in the U.S. that would be the Better Business Bureau. See if there are any complaints against the online store you plan to purchase your gown from. If you see the Better Business Bureau logo on a site, that means they are a member of the BBB. The site is committed to uphold a high standard of business ethics and practices. It's a little known fact that... if a dispute arises between you and the retailer, you can contact the Better Business Bureau to arbitrate the matter since the online store is a member. Having them involved will expedite getting the matter resolved. This should give you peace of mind, especially since you are ordering something as important as a wedding gown. 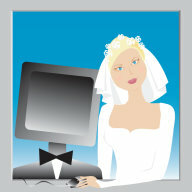 When buying your wedding dress online.. make sure the site you are ordering from has the proper security in place. You should see logos of certain security certifications prominently displayed on the site for the payment system they use. Some will send you to a portal like Paypal to pay for your purchase, which is safe to use. But remember, it's best to pay using a credit card (not a debit card or electronic check), because credit card companies provide consumer protection through their dispute process that favors the consumer. Debit cards linked to your bank account WILL NOT provide any protection. Examine closely their pricing, delivery times and policies. Especially pay careful attention to their return policies. Return policies vary greatly, some have absolutely no refunds and others allow full or partial refunds. Do not rush through this process. If there is an error on your part, you will be stuck with the problem. When reading reviews note how the company handle problems. If one arises you will be handling it on the phone or email. Check out this article on Frequently asked questions about ordering discount bridal gowns. Learn how to avoid mistakes when ordering discount wedding gowns. Here's the best place online to buy discount bridal dresses.